One of the key challenges current biomaterials researchers face is identifying which of the dizzying number of highly specialized characterization tools can be gainfully applied to different materials and biomedical devices. Since this diverse marketplace of tools and techniques can be used for numerous applications, choosing the proper characterization tool is highly important, saving both time and resources. 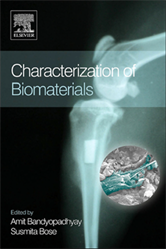 Characterization of Biomaterials is a detailed and multidisciplinary discussion of the physical, chemical, mechanical, surface, in vitro and in vivo characterization tools and techniques of increasing importance to fundamental biomaterials research. Characterization of Biomaterials will serve as a comprehensive resource for biomaterials researchers requiring detailed information on physical, chemical, mechanical, surface, and in vitro or in vivo characterization. The book is designed for materials scientists, bioengineers, biologists, clinicians and biomedical device researchers seeking input on planning on how to test their novel materials, structures or biomedical devices to a specific application. Chapters are developed considering the need for industrial researchers as well as academics.